Victor Navarro with orishas Oshun, Yemayá, and Obatalá. In 2011, Victor Navarro went to a party where a woman wearing white introduced him to a pantheon of deities—some fierce, some gentle—then tossed cowrie shells and read them to reveal something about his past, present, and future. Navarro was enchanted. “It was so interesting and accurate,” he said. The woman was a babalocha, a practitioner of Regla de Ocha, commonly known as Santería, an Afro-Cuban religion. Santería comes from the Yoruba people of West Africa and was brought to Cuba and other parts of the Caribbean by slaves. In Brazil, the tradition became known as Candomblé. It is based on over 400 orisha deities, each with distinct personalities and governing styles, who guide and protect practitioners. The orishas are intermediaries between humans and God and are said to reflect the supreme divine, which comes in three forms, Olodumare, Olorun, and Olofi. Much of the practice was passed down orally through dance and song and secret ceremonies. When slaves were converted to Catholicism throughout the Caribbean, they continued to practice their traditional religion, but hid it by assigning or “syncretizing” each orisha to a Catholic saint. In many cases, saints and orishas have similar characteristics. When Fidel Castro declared Cuba an atheist state after the 1959 revolution, the religious practice went largely underground, but remained part of cultural life through music, dance, and celebration. Navarro wears elekes (necklaces) in honor of the orishas and a white hat to protect the site where the orisha was bestowed. But since there is no significant Santería community in Tucson, as there is in Los Angeles, Chicago, New York, and Miami, it’s harder to carry out the necessary ceremony, Navarro says, which requires other spiritual leaders and various ceremonial herbs, foods, and items. “My madrina said, Let’s go to Cuba. So we went to Cuba,” Navarro says. Those who practice the religion are said to have orisha parents, a mother and father who guides and protects them. These orishas are given to practitioners by a high priest, or babalao. 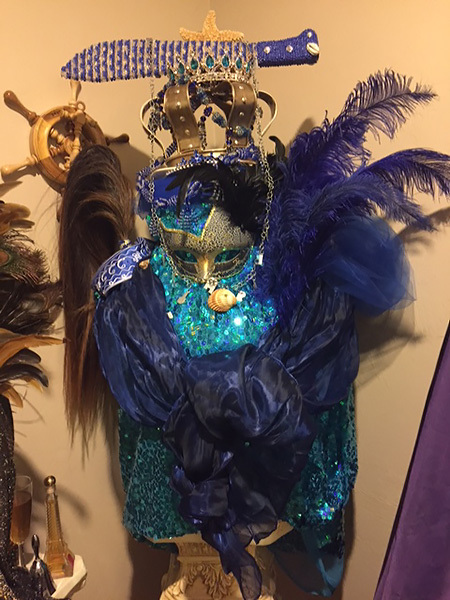 Navarro’s “mother” orisha is Yemayá, deity of the ocean. In Cuba, Navarro was given his mother orisha, Yemayá, the great mother of the ocean, during a seven-day ceremony. Yemayá, a mother deity, is nurturing and fierce, like the ocean. She is represented by the colors blue and white and the number seven. She wears a full skirt to represent the waves and dances. She likes shells, fish, nets, and other sea-related items. Part of the ceremony, Navarro says, also involved “feeding” the orisha their favorite foods, or blood of their favorite animals. “Each orisha ‘eats’ the blood of a different animal. Yemayá eats duck, tortoise, goat,” he said, which meant he had to procure a goat to be sacrificed for the ceremony. 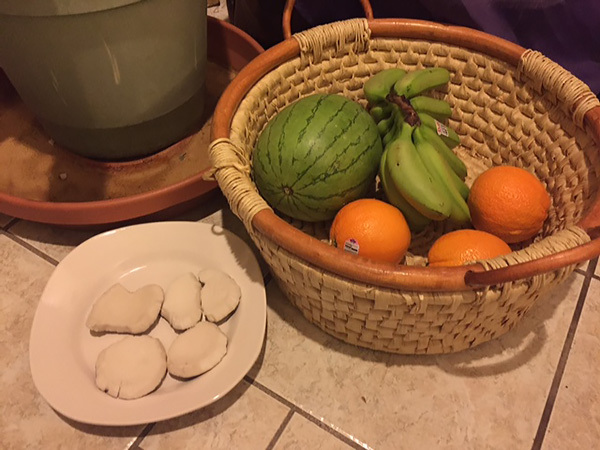 Babalochas give offerings such as fruit to the orishas and use coconut meat for divinations. 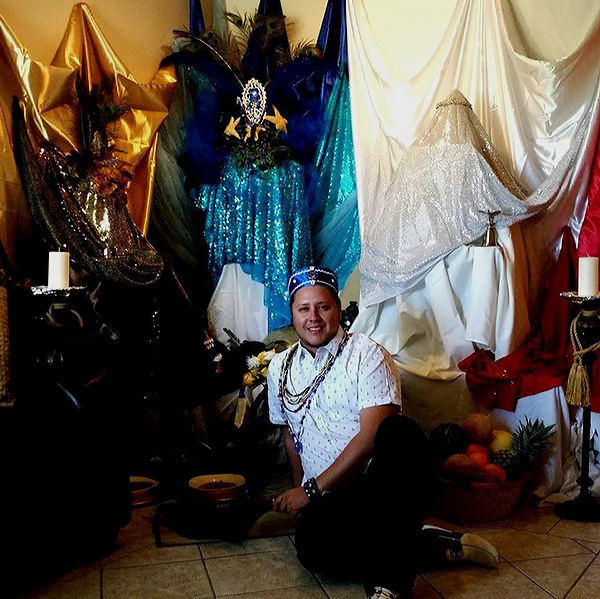 Navarro says following the orishas, at heart, helps practitioners be good human beings, live a stable life without problems, and evolve along a spiritual path. Santería is also about respecting and working with nature, and animals are a part of that, Navarro says. The orishas are also consecrated in stones and plants. For example, there are at least 200 plants for each deity, used to make water essences for for drinking and bathing, he says. Navarro’s “father” deity is Babalú Ayé, father deity of the earth and of sickness and health. The corresponding Catholic saint is St. Lazarus. Before Navarro received this orisha, curiously, he fell ill.
Navarro’s “father” orisha is Babalú Ayé, deity of health and healing. Navarro has integrated the orishas fully into his daily life. Nearly life-sized artistic representations of Oshun, Yemama, and Babaluaye—his most important deities—fill the corner of his living room. 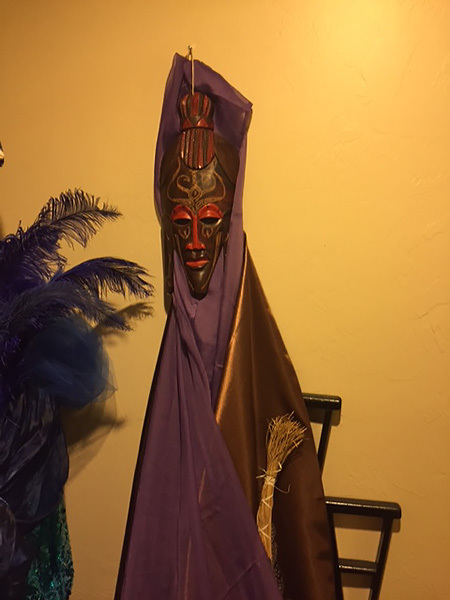 By the front door are smaller representations of Oshosi, a warrior hunter; Ogún, a metal warrior, and Eleguá, the lord of the crossroads, said to open and close doors. When necessary he brings offerings to them, special fruits and once a chocolate cake. Navarro has begun to offer divinations to help people resolve issues in their life. 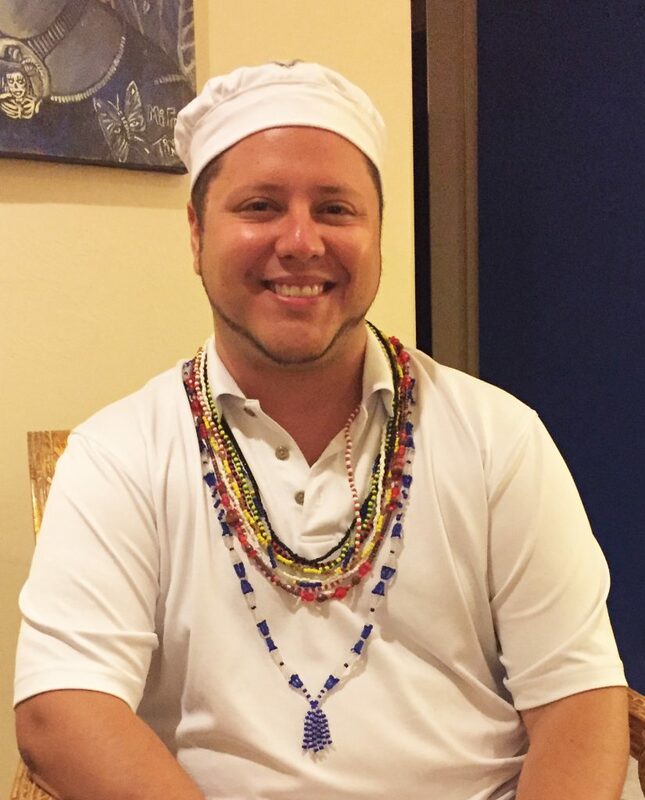 When divining or in ceremony, he wears all white with elekes, or colorful beaded necklaces, each one corresponding to a certain orisha. Divinations are given by reading pieces of coconut, which, depending on how they land, shell or flesh up, offer a “yes” or a “no” to the sought-after question. 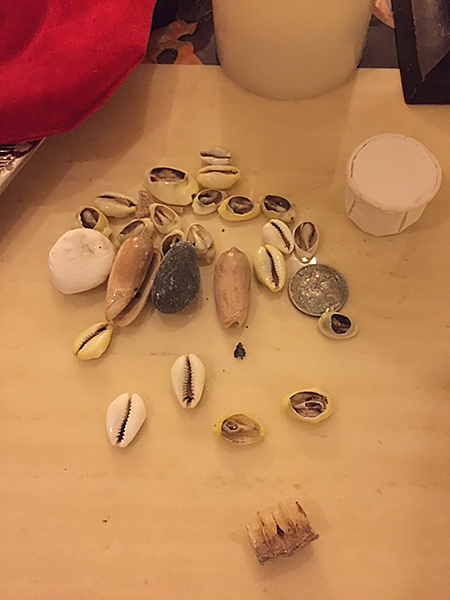 More elaborate are the cowrie shell divinations, which offer stories called “patakies” for particular situations. Navarro keeps cowrie shells in a red pouch. There are 16 of them, which means over 200 combinations, each of which offers different information. Before divining, he must cleanse his hands with cascarilla, eggshell powder. Before tossing the shells, he blows on them first, representing the mouth of Eleguá, deity of the crossroads, and asks for guidance.